This is usually caused by files with incorrect permissions being uploaded to the website. Here are some steps on how to fix it. Scroll down to the Metrics section and select Errors. Review the error log. The top line is the most recent error you were viewing. It shows above that the specific file is writable by group. We need to login to the file manager and change the permissions. Go back to the main dashboard and select file manager. Go to the directory where you&apos;re receiving the error. Then right click the file and select change permissions. You will be viewing the file below as shown. As visible in the image above. The group can write to the file. Simply deselect the box in the middle of the 3x3 checkbox grid. The bottom numbers should say 644. 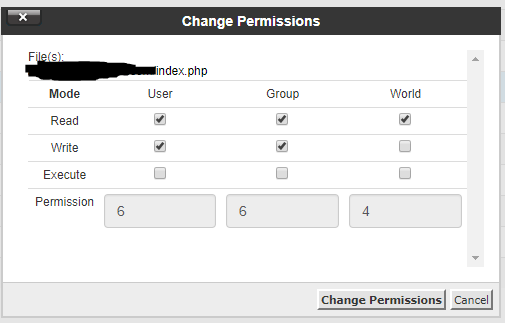 Once your set, hit change permissions. Then you&apos;re done! If you&apos;re having the same issues with the folders. Simply change the folders the same way above. They will have different permission numbers. Just ensure the middle box is unclicked as well! The file should be functioning properly now!